A Wal-Mart worker has died after being trampled by a throng of shoppers shortly after a store opened Friday on Long Island in New York State, police said. Frenzied shoppers desperate for bargains broke down the doors at a 5 a.m. sale. Other workers were trampled as they tried to rescue the man, and customers shouted angrily and kept shopping when store officials said they were closing because of the death, police and witnesses said. Shoppers stepped over the man on the ground and streamed into the store. When told to leave, some complained that they had been in line since Thursday morning. "This crowd was out of control," said Nassau police spokesman Lt. Michael Fleming. He described the scene as "utter chaos," and said the store didn't have enough security. Damour, 34, was taken to a hospital, where he was pronounced dead about 6 a.m., police said. The exact cause of death has not been determined. Shopping violence also broke out in Palm Desert, Calif., on Friday afternoon. Two people were killed inside a Toys "R" Us store in the southern California community, said Riverside County sheriff's Sgt. Dennis Gutierrez. Witnesses reported hearing four shots at about 11:30 a.m. and nearby stores reported that customers and staff were seen running from the building. The two men were shot after a confrontation apparently involving rival groups, city officials said. Riverside County sheriff department Sgt. Dennis Gutierrez confirmed there was a fight but said it was not over a toy. 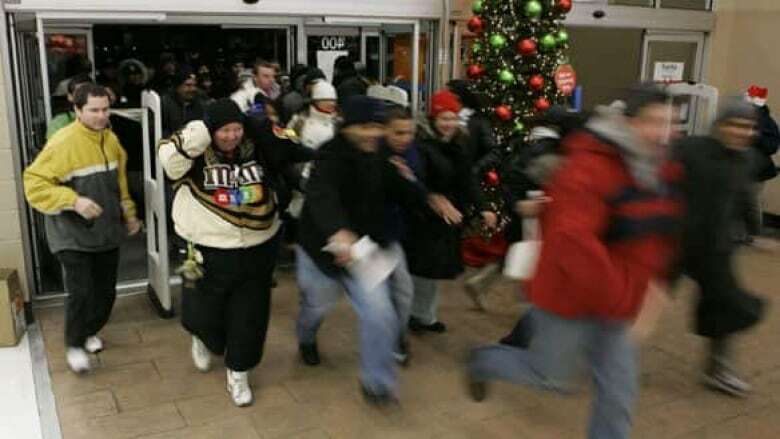 Known as Black Friday, the day after U.S. Thanksgiving is the traditional kickoff to the Christmas shopping season. Many stores open early and offer deep discounts, leading to long lineups and crowd surges when the doors open. YOUR VIEW: Could it happen in Canada?